Win a Ride on the New Goodyear Blimp! Wingfoot One, the brand new Goodyear blimp, is coming to New England for the first time in September! The blimp, actually an “airship”, has many upgrades from the original Goodyear blimps! Here are some interesting facts on the new blimp! Its overall length is 246.4 feet, this is the equivalent of over six school buses! The maximum speed it can reach is 73 miles per hour! 14 people can fit in at once, twice as many as the original blimp in 1972. Wingfoot One is over 30 decibels quieter from the inside and outside than the original blimp. Riding in a blimp is a once in a lifetime opportunity, and Sullivan tire is giving you a chance! Visit our Facebook Page and Enter to Win a ride for two on September 2nd! You can also enter to win at our Watertown location on August 29th at our Customer Appreciation Event! The drawing will occur shortly after the event for a ride on September 2nd! The radio station 92.5 “The River” will also be in attendance preforming a Live Remote! Be sure to come by the Sullivan Tire in Watertown between noon-2pm on the 29th to get a chance to ride in the blimp as well as capitalize on great deals on tires and auto service! The Goodyear Assurance All-Season tire is a practical tire for confident all-season traction in wet, dry, and snowy conditions. It has long tread wear with a warranty of 65,000 miles. Multiple biting edges: Offer great all-season traction in wet, dry and snowy conditions. Wide tread grooves: Help evacuate water and slush for enhanced wet traction. Optimized tread pattern: Reduces road noise for a quieter ride. Large stable shoulder blocks: For confident dry and wet handling. Looking for a fuel-efficient option? The Goodyear Assurance Fuel Max provides confident wet and dry traction while helping you save at the pump. Fuel-saving tread compound: Helps reduce energy loss as the tire rolls to save 2,600 miles worth of gas over the life of the tire. Wet tread zone with dual Aquachannel grooves: Helps evacuate water away from the treadface for great traction on wet roads. Dry tread zone with solid shoulder blocks: Helps enhance handling and grip for confident maneuvering on dry pavement. Right now, save 10% on all Goodyear Assurance line tires! Find your tires and book your appointment today! Sullivan Tire’s 60th Anniversary Year starts NOW with an exclusive Buy 3, Get 1 FREE sale on all Goodyear & Sullivan Value Line Tires! 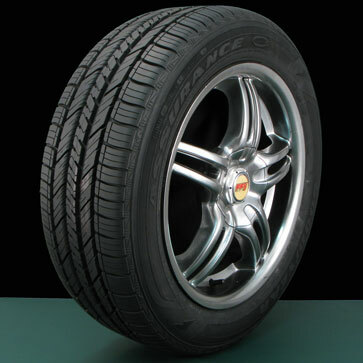 We have thousands of qualifying tires in stock right now! Whatever you drive – Buy 3 Goodyear or Sullivan Value Line Tires and get the 4th FREE! PLUS! Save up to an extra $120 Off on select Goodyear tires! This offer is valid on in-stock tires only and expires on March 29th. Exclusions apply. THANK YOU to New England for the years of business as we head in to our milestone year! Today’s Tire Tip Tuesday is a feature on one of the great, name brand, high quality products we provide at Sullivan Tire and Auto Service: the Goodyear Assurance Fuel Max tire (which is on sale during our Buy 3 Get 1 Free sale until August 2)! This is Goodyear’s best tire for enhancing fuel savings, as the Fuel Max can save you 4% (or 2,600 miles worth of gas) over the life of the tires. Plus, this 65,000 mile warranty tire provides all the tread life, comfort, and all-season traction you expect from a Goodyear touring tire. With gas prices continuously on the rise, road trips throughout the summer, the Goodyear Assurance Fuel Max is a perfect choice for the driver looking to save a bit of money this summer. And those savings will be multiplied when you buy your Fuel Max tires at Sullivan Tire and Auto Service from now until August 2nd. You can either get a FREE tire with our Buy 3 Get 1 Free sale, or save 15% off the price of two tires. Call any one of our locations throughout New England to reserve your Goodyear Assurance Fuel Max tires today! Have you ever driven Fuel Max tires? Did you notice the fuel savings? What other gas saving tips do you have? Let us know in the comments! Mid Summer Sale: Buy 3 Get 1 Free! The weather is hot and so are the tire sales at Sullivan Tire! We are offering TWO great Buy 3 Get 1 Free sales until August 2nd. First, we are extending our Buy 3 Get 1 Free on the Sullivan Tire Value Line, and adding a Buy 1 Get 1 50% off on the Value Line as well! Call our Tire Experts at 877-855-4826 or visit any one of our retail locations throughout New England, to find out which tire is right for you! Do you have a favorite Goodyear tire? Will you be taking advantage of this great summer sale?